The future literally knocks on the door in 2097: We Made Ourselves Over. It insists on being let in and examined in all its aspects and implications. Our biggest and most ambitious work to date, 2097: We Made Ourselves Over was inspired by the citizens of two cities and sought to build on the unnerving and exhilarating idea that we all have the power to act and influence the future. 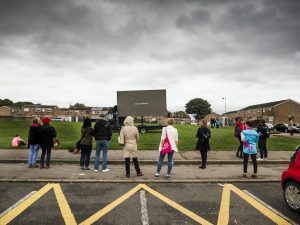 Working in Aarhus, Denmark, the current European Capital of Culture, and Hull the current UK City of Culture – we ran workshops with school kids, young people and the over 60s to ask people about the big questions facing us in the future. We spoke to experts in digital currencies, climate change, artificial intelligence and even a tarot reader to help us sketch out futures that are probable, possible or desirable in a series of expert interview films. 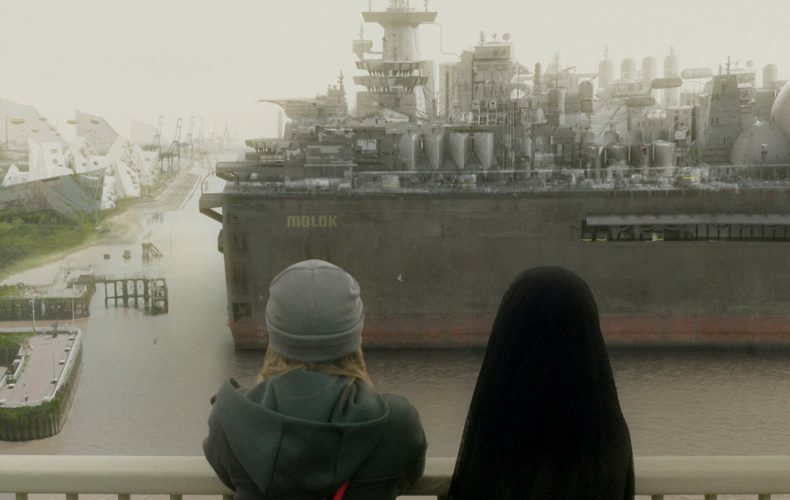 The ideas and challenges raised by the people of Hull and Aarhus set out where we began with the stories for the 2097 science-fiction films. 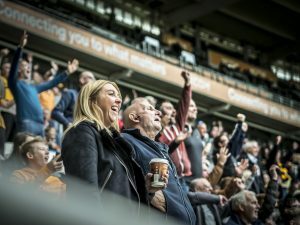 What is it that makes a community? And what are the things that sustain us in the face of change? 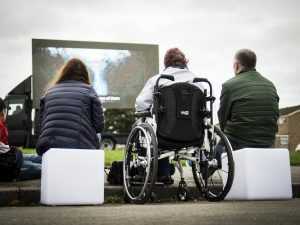 The films consider the themes and questions raised in the workshops – from death and the idea of transferring knowledge to the young when we die, to machines and how cities grow for the good of the community. 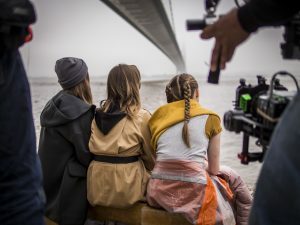 Shot in the UK and Denmark during July 2017, the 2097 films take place at the cusp of the next century and follow the journey of three young girls who must make a decision which will affect their entire city. In the first month of being online, the five films were watched ten thousand times on YouTube alone. 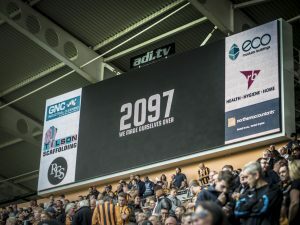 Throughout the summer the project gathered pace; as giant screens at Hull City FC matches flashed futuristic scenes of Hull in 80 years time and mysterious images of phone boxes appeared on people’s Facebook and Instagram feeds – word was spreading that something big was coming to Hull. 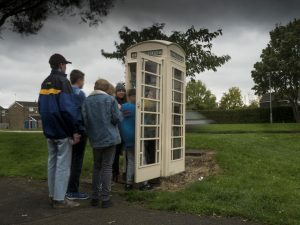 On October 1st the phone boxes of Hull rang together. 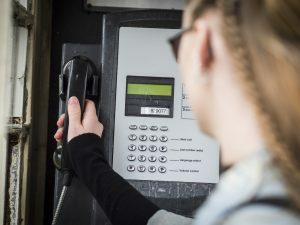 Queues formed outside the city’s unique cream phone boxes as hundreds of people gathered to wait for the call. The future was arriving and it came to every neighbourhood across the city. At the end of the line Hessa – one of the three rulers of the future city – asked for your help. 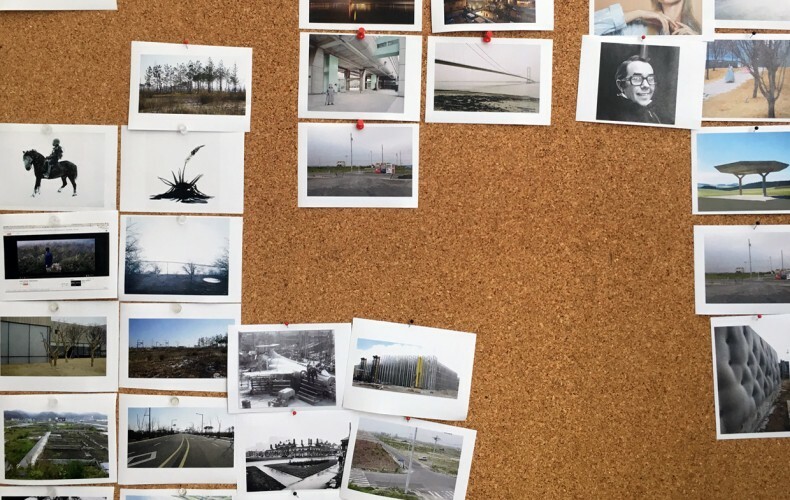 From the hundreds of people who answered and the thousands who rang in over the course of the month, hundreds of recordings were made; gathering ideas for the future of the city. “Very thought provoking, I won’t be around in 80 years but my future family will. It is quite scary where the world is going and how it’s developing and changing. My parents are dead but I’m sure things that are happening today were never thought of, or were they? 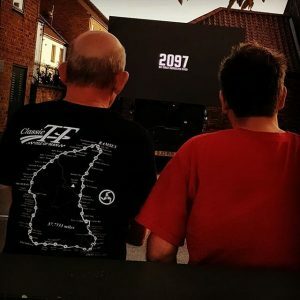 Technology is fabulous but also advancements sometimes happen so quick.” – 2097: Live in Hull participant. 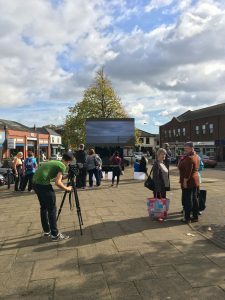 From fairs, parks and shopping centres to outside pubs, chip shops and post offices – over five weekends people came in their thousands to watch the 2097 films at pop-up screenings across Hull. 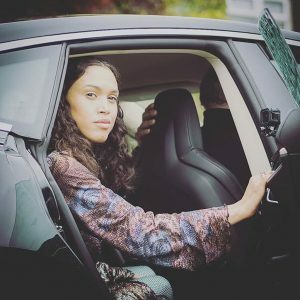 And as the phone boxes rang and film screenings took place, electric cars began a journey around the city, picking up hundreds of passengers from phone boxes over the five weekends of October. Each journey brought passengers face-to-face with a character from 2097; inviting them to reflect on the changes they’d like to see in the decades to come. 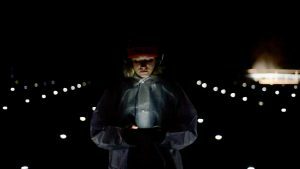 In Aarhus too, we were overwhelmed by the incredible response to 2097, with the first wave of tickets selling out in days and the second and third ticket releases also selling out almost immediately. 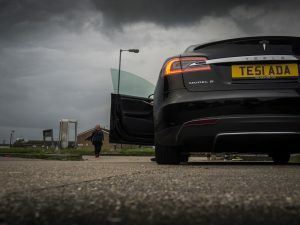 Every evening from Monday 30 October to Sunday 5 November, a fleet of private electric cars arrived in the city, taking people to a secret location where they were dropped into the science fiction world of 2097. “The kaleidoscopic view from the covered windows at the rear of the car, mixed with the narrator’s stories and the sleepy synth music makes the future suddenly seem present. The Aarhus, which rolls past the kaleidoscope window, is not the Aarhus I know. It’s a city that suddenly feels strange. 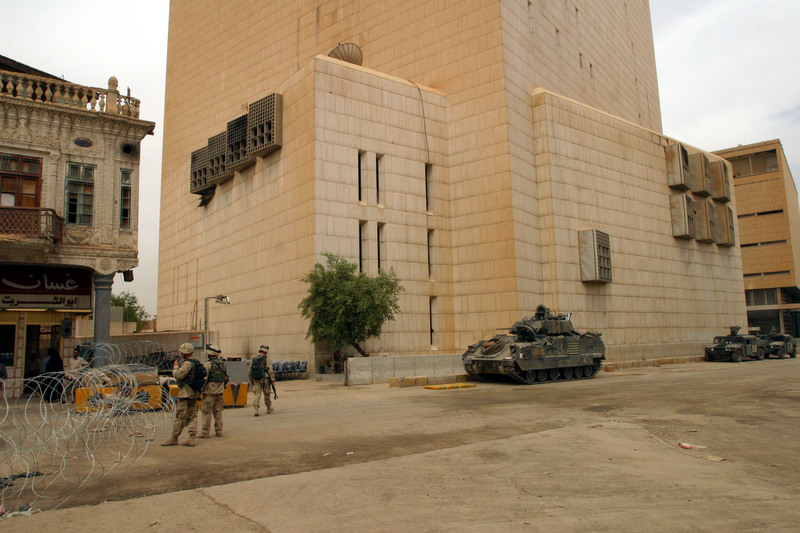 A city that has been demolished and recreated countless times of molecular harvesting machines. A city where memories are transferred from the dying to the living as ink droplets in a glass of water.” – Ask Hastrup, 2097: Live in Aarhus participant, Kunsten-nu. 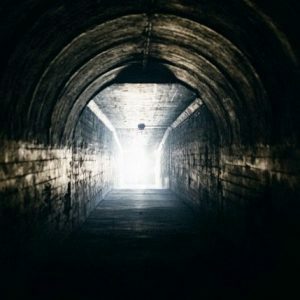 Exploring tunnels, stairwells, and floodlit spaces using a handheld audio GPS device with voices from the future, a story is slowly revealed : “I get to a staircase, and from there I go up under the open sky again. Here I am greeted by an overwhelming sight. What looks like hundreds of little light spots shine on the otherwise large, dark space that I have to explore to put together the jigsaw puzzle.” – 2097: Live in Aarhus participant, Fine Spind. 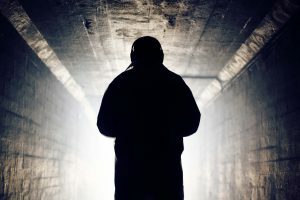 “Alone with the beautiful electronic soundtrack in my ears, I move on into the tunnel. At the end a bright light shines. In the headphones I am introduced to Hessa. She tells me that she has gone where I am now walking, many times. She can remember the walls, how they feel, and how one’s hands feel when they touch them. 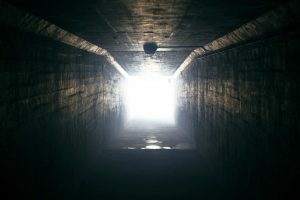 I turn left at the end of the tunnel and enter the cold evening air. 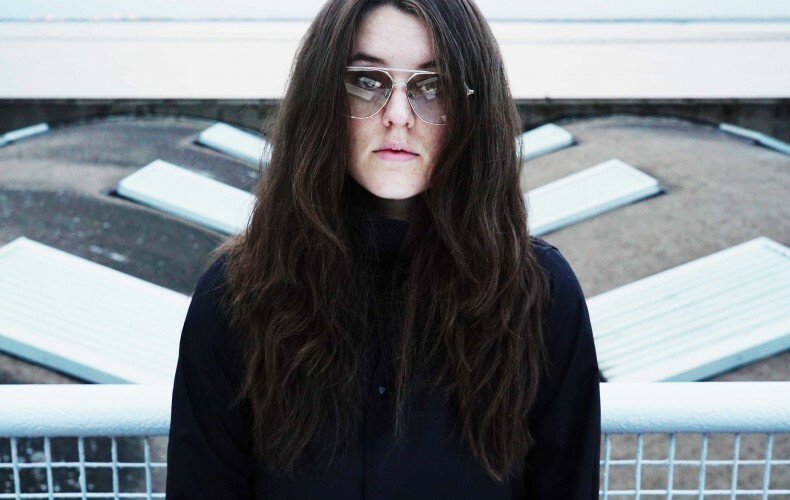 Out into 2097″ – 2097: Live in Aarhus participant, Vink Aarhus. Finally coming face-to-face with a character from the future, participants were asked to reflect on their desires for the coming century: “The future is where you and those you care about will spend the rest of your life. And what the future looks like depends on the choices you make” – Ask Hastrup, 2097 participant, Kunsten-nu. From floating locust farms, habitation pods and molecular harvesters, to kaleidoscopic car journeys, secret night time locations and face to face conversations with characters from the future – 2097 has combined film, live performance and interactive experiences to create a breathtaking sci-fi world 80 years from now. 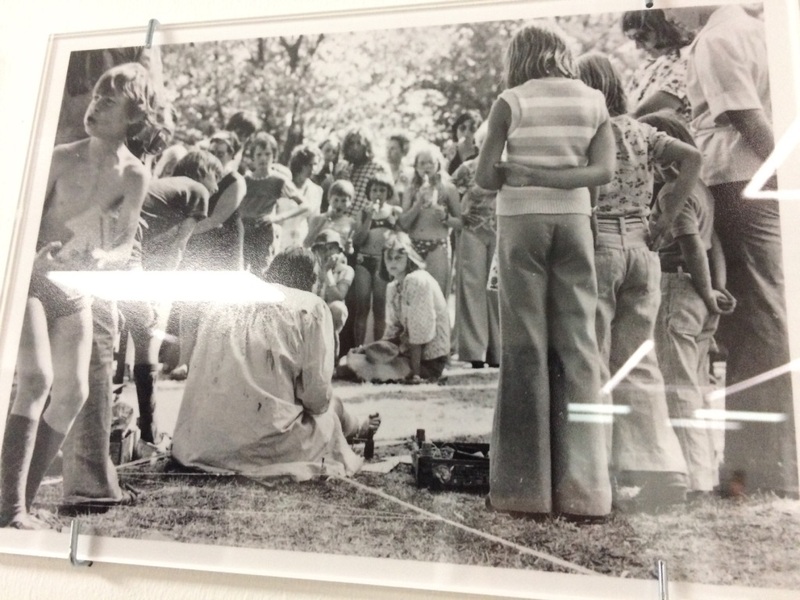 “Made me think, we are all small but can create changes in everything…” – 2097: Live in Aarhus participant. 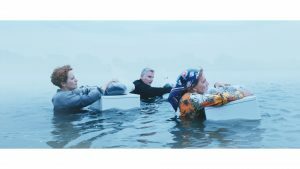 2097: We Made Ourselves Over is a Blast Theory work co-commissioned by Hull UK City of Culture 2017 and Aarhus European Capital of Culture 2017 in association with KCOM. 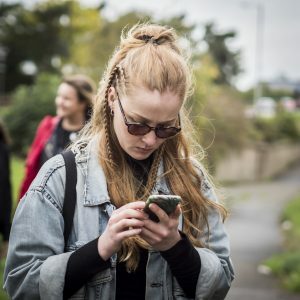 If you’d like to still take part then download the 2097 app to watch all five films and play the five interactive episodes. 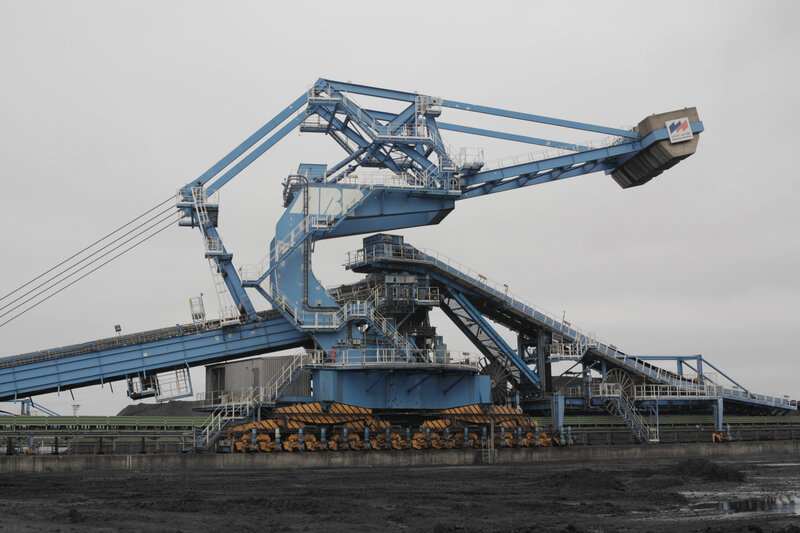 Aarhus and Hull are both home to some of the largest machines you might get to see. 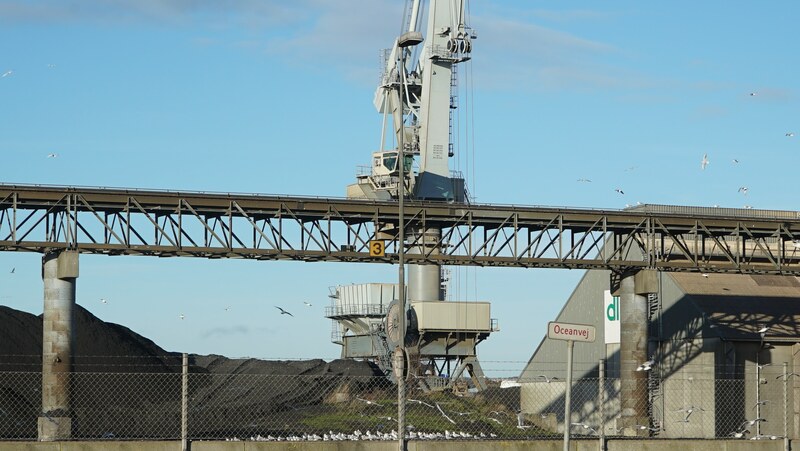 Across the water from the city centre in each you’ll find the cranes and lifters of their respective ports – moving containers cars and bulk material by the tonne. 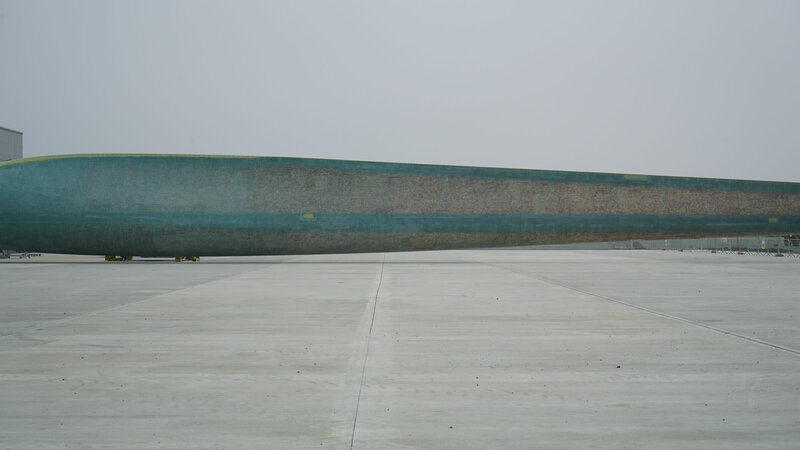 While the new Siemens factory in Hull has begun fabricating 75m log turbine blades – the world’s largest handmade fiber glass components cast as a single element. “Technology has the habit of progressing in leaps and bounds and I think there is little doubt robots will be noticeable by their presence in 2097. They will come in all manner of shapes and sizes, but there will be those that are basically human shaped in terms of having a clearly defined head, torso, arm and leg parts. It would make sense so that could operate equipment and machines designed for human use. I very much doubt whether we will see robots that will actually look like real humans and function like us by 2097. Basic work robots will be quite utilitarian and designed for many different roles in all weather conditions and environments. With highly efficient and powerful hydraulic systems or rotary motors, robot body forms will be quite simple and straight forward. 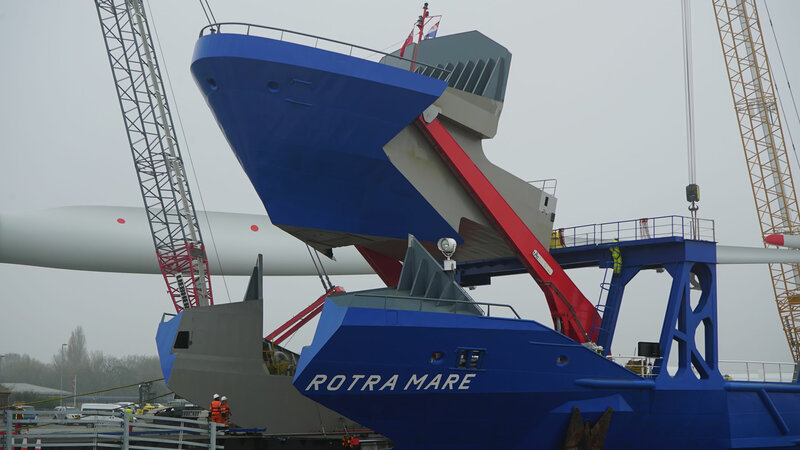 Robots may well very expensive to buy and replace so it will be essential for any working part to be replaced quickly and efficiently in any environment and conditions. So for example, should an upper arm unit fail it could be very easily replaced in situ and the robot put back to work as quickly as possible. Some robots might be seen doing mundane jobs like collecting litter, sweeping roads, unloading cargos etc. whilst others will more dangerous tasks in environments hazardous to humans like working in mines, nuclear power stations, quarries etc. Robots will be capable of working continuously 24/7 until competition of a task, only requiring breaks to reprogramme, recharge their power source or servicing requirements. In appearance those seen on city streets would be well maintained, possibly brightly coloured and marked with company logos, their designated role and even advertising. Those working in factories or out in the fields will probably look pretty worn with lots of paint chips, dirt and grime. 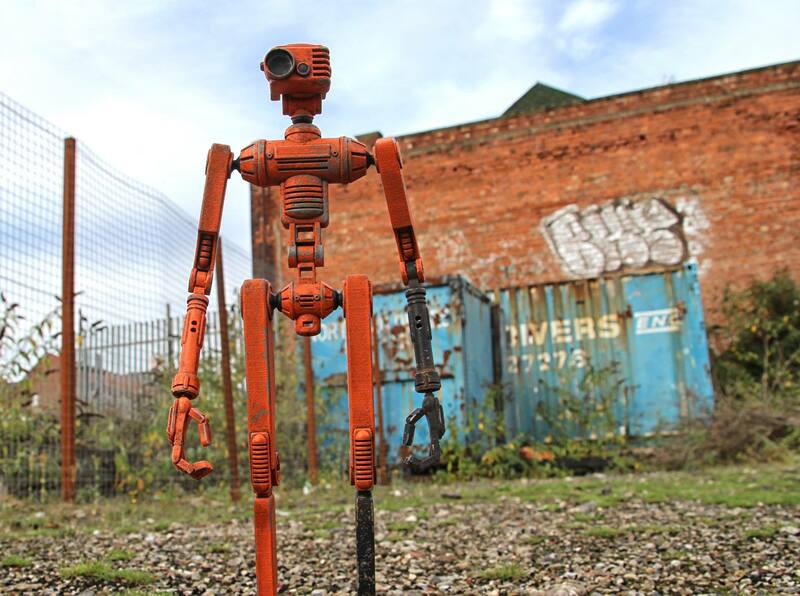 Robots that are metal fabricated might well be quite rusty. Replacement parts will stand out as being clean and possibly in different colours. What does 2097 look like? Take a look at some of the images scriptwriter Matt has been drawing inspiration from to create the world of the five sci-fi films. Can you imagine these buildings, objects and people being part of your city in 80 years time? 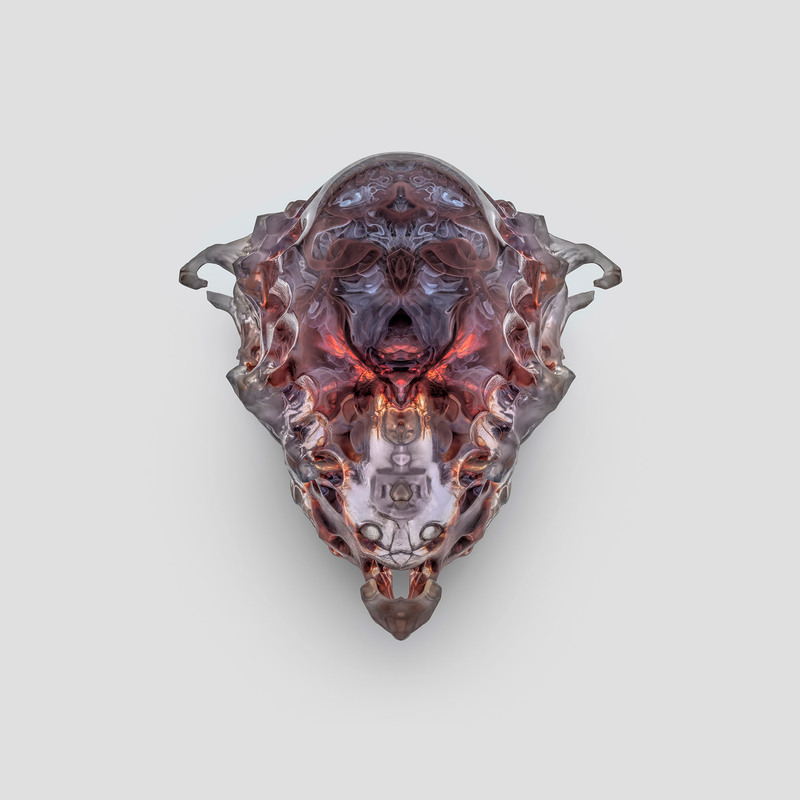 Thinking about what ceremonial objects may look like 80 years from now, we came across these beautiful 3D printed death masks by Neri Oxman on Dezeen. The bruise-colours and the crystalline quality of the material have a sci-fi edge, almost like the object is alive, “I love the idea that in the future 3D printers will create objects of high cultural value”. In January Matt, Ju and Nick were in South Korea and drove past these on the way to Incheon. 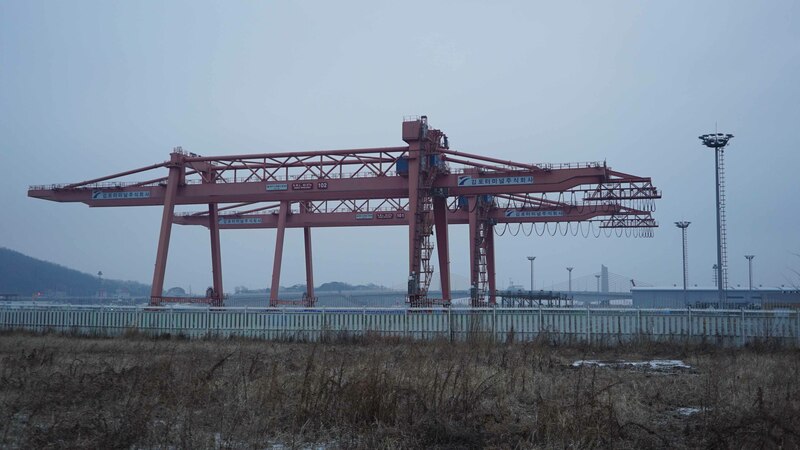 Machines will undoubtedly change in the next 80 years but cranes from 1937 wouldn’t look that far out of place today. 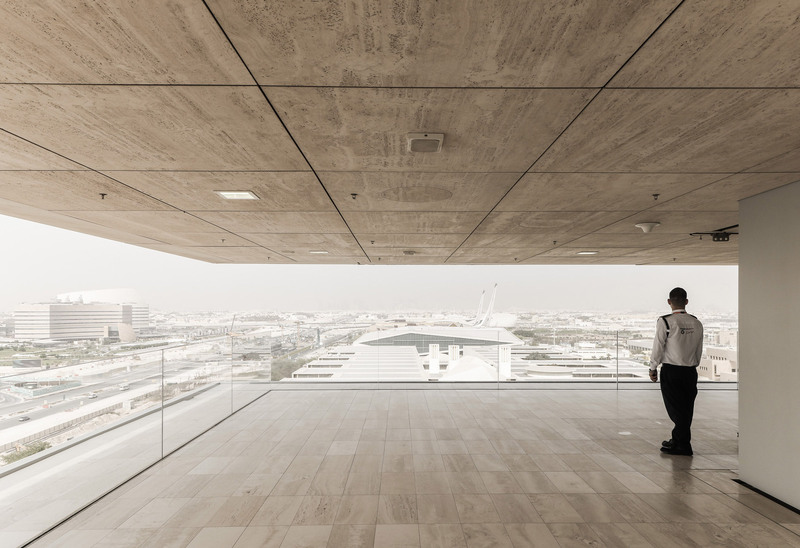 This photo of the recently opened Qatar Foundation in Doha, designed by OMA is striking in a different way. From the inside it has this fantastic panoramic view of the city framed between the concrete. It seems remote from the ground below. 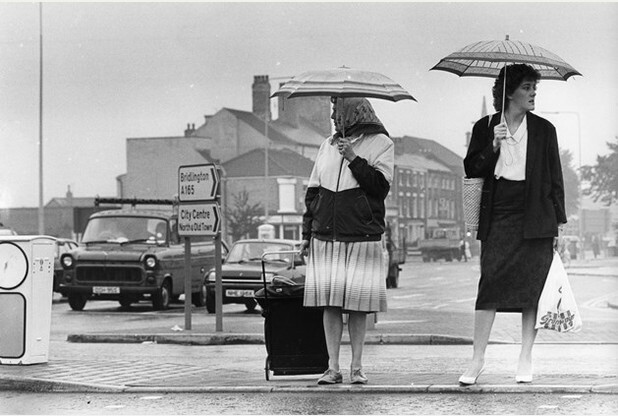 Umbrellas, skirts, cardigans and patterns. Artist Nick has been looking to the past for inspiration on future clothes. After all things often come back into fashion. Over the next few weeks we’ll be posting more snippets of inspiration that have influenced the film scripts form Aarhus, Hull and beyond. THIS BLOG claims no credit for any images posted on this site unless otherwise noted. Images on this blog are copyright to its respectful owners. If there is an image appearing on this blog that belongs to you and do not wish for it appear on this site, please e-mail hello@wemadeourselvesover.com with a link to the image and it will be promptly removed. 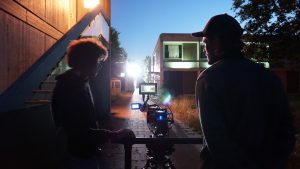 Want to star in a series of sci-fi shorts? 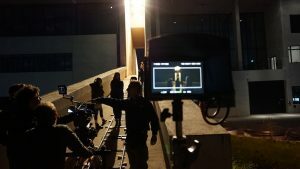 Are you an actor and up for a new challenge? 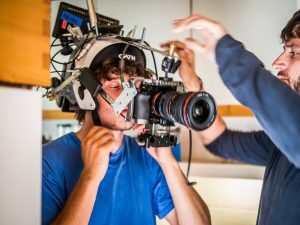 The search is on for two older Danish actors as a casting call launches for major roles in a series of short sci-fi films being shot in the city. 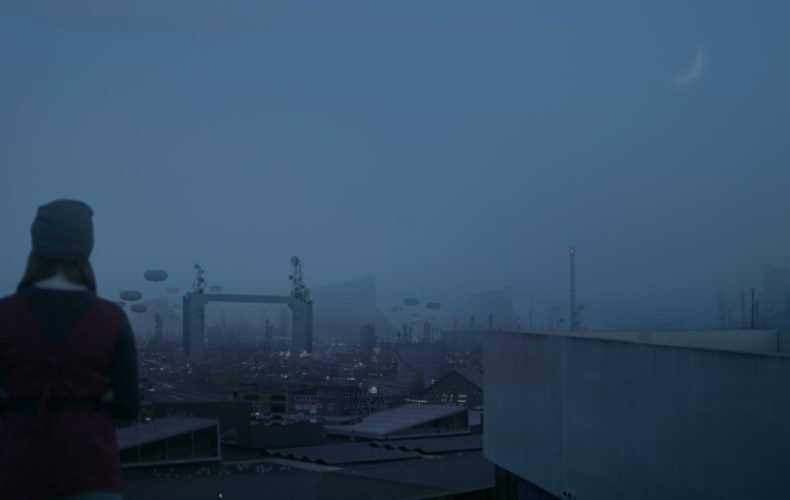 The sci-fi films are part of the Aarhus European Capital of Culture 2017 commissioned 2097: We Made Ourselves Over, a year-long interactive art project by internationally renowned artists group Blast Theory that invites the cities of Aarhus and Hull, UK to reimagine their communities 80 years in the future. Now, Blast Theory are looking for one male and one female actor in their late 50s to take part in filming in Hull and Aarhus in June and July 2017. The films will be screened online and in both cities later this year. Matt Adams from Blast Theory says: “It is the year 2097 and a new era is dawning in the city of Aarhull. Mass and Varda are in their late 50s and are ready to walk an epic journey. Interested candidates are asked to register their interest by emailing gizmo@caster.com by 22 May, with their name, age, address and a recent photograph. Good luck! Auditions will take place in Aarhus on 24 May. It’s 2097. And today you died. What’s cooking for the future?